Welcome to Ron Gordon Watch Repair. My shop is conveniently located in Midtown New York City. My workshop is equipped with modern state of the art machinery to handle all phases of watch repair, water resistant testing and case and bracelet refinishing. I have over 30 years of experience and knowledge with the tools to do the job right. All work is done in house. If you have a TAG Heuer, and are looking for professional TAG Heuer watch repair in New York, NY, please bring your watch in to my shop in Midtown Manhattan for a free estimate on TAG Heuer watch repair in NY, NY. You can also call or email. I am happy to help! Edward Heuer founded his watch shop in Saint-Imier, Switzerland in 1860. In 1864 business has flourished, and he moved his shop to the Bienne. 12 years later Edward Heuer died, leaving a huge fortune to his two sons Jules and Charles. Heuer’s sons were leading the family business, specializing in racing chronographs. Together they became a big name in Swiss watches. Fast-forward to 1996, TAG-HEUER appears on the stock market. 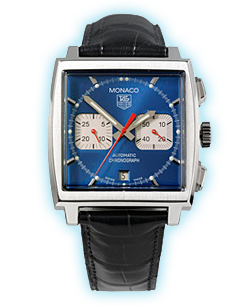 Two years later in 1998 Tag-Heuer launched production of a brand new version of the famous MONACO. On September 13, 1999 Tag Heuer was sold again – and Tag-Heuer’s CEO accepted a bid from LVMH Moët Hennessy Louis Vuitton S.A. of $739 million dollars contingent upon a transfer of 50.1% of stocks. Tag Heuer is one of the top qaulity brands that I repair. In fact, even in 2013, TAG Heuer remains a luxury watch that means style. Many people today choose TAG Heuer watches for both luxury and sports uses, and they can bring their TAG Heuer watches into my TAG Heuer watch repair shop in midtown Manhattan for a checkup, or a full watch repair, depending on their needs. Your TAG Heuer watch is a high performance timepiece and it needs to be serviced regularly for it to work correctly. There are 2 types of maintenance TAG Heuer recommends. I conduct all regular maintenance for TAG Heuer watches to keep them in tip-top condition. Replacement of all gaskets using only TAG Heuer parts. Ultrasonic cleaning of case and bracelet. Final visual and technical inspection. I disassemble the movement completely and replace any worn or broken parts with genuine TAG Heuer replacement parts. The watch is reassembled, oiled and timed to TAG Heuer factory specifications. Then I replace all gaskets and restore the water resistance to TAG Heuer factory specifications. Case and bracelet refinished to TAG Heuer factory specs. Then I test the watch for 72 hours before it is ready for my customer. TAG Heuer watches are high-precision timepieces, bring your watch in today for a free evaluation or call or email me anytime. Ron Gordon Watches also repairs other watch brands such as Tag Heuer, Breitling, Longines, Hamilton, Omega, Rado, Rolex, Citizen, Tissot, Jaeger LeCoultre, and other major watch brands. If you are own luxury watch, please call or email me and I will be happy to answer any questions regarding your timepiece, or just stop in for a free estimate. For the purposes of our neighborhood classification, Midtown is everything between 14th and 59th streets, (Manhattan community districts 4, 5 and 6). Midtown’s lower central part (14th through 34th street) is often referred to as “Midtown South” and exhibits many features that are more characteristic of Downtown. Overall, compared to Downtown, Midtown is more “reserved”, touristy (especially around the Times Square area), somewhat older (although not everywhere) and architecturally homogeneous – thanks in part to Manhattan’s geology, which allows to build very tall buildings in the island’s Midtown core, and in part to the history of its development. Many of the city’s hotels are located in Midtown.